What's wrong with this picture? Well, nothing until the very end. But VFR aircraft don't shoot instrument approaches - except in relatively rare circumstances and even then, only for practice (as I'll describe below). There's a lot of confusion (and not limited to pilots, either) about the distinctions between VFR and IFR, and this article endeavors to clarify the definitions of these two terms, and explain the ATC services available to VFR and IFR pilots. In the real world, pilots learn VFR flight first, and then require additional instruction and checkrides to earn an IFR rating. On VATSIM, however, most pilots begin and end with IFR flight. Although the actual flying is more difficult when it's accomplished solely by reference to instruments, the ATC interaction tends to be much less complex, so we'll deal with IFR first. Perhaps the easiest way to understand what it means to fly IFR is that the pilot effectively transfers responsibility for terrain and traffic separation from himself to the air traffic control system. There are, indeed, exceptions to this generalization (for instance, a pilot on an IFR flight plan may accept a visual approach, thereby assuming responsibility for terrain separation, or agree to â€œmaintain visual separationâ€ from another aircraft that a controller has pointed out), but for our purposes it's functional. Many pilots assume that IFR is really just a way to fly in poor weather, but from the above explanation, it's easy to see other reasons as well, the main one being traffic separation. In fact, scheduled air carriers are legally required to file IFR on revenue flights, even if the weather is â€œsevere clear,â€ and the rationale for this is simply the added margin of safety afforded by having controllers provide radar separation in addition to looking out the window. Following an accepted IFR routing also ensures that you won't accidentally enter any military restricted airspace, or stray into a busy terminal area without clearance. Finally, VFR flight is prohibited in Class A (Alpha) airspace, which in North America extends from 18,000 to 60,000 feet MSL. Of course, all of these advantages do come at a cost. The main disadvantage of IFR is that you must file, and then fly, a defined, point-to-point routing, usually via airways. You must maintain assigned altitudes and follow ATC instructions at all times, except when you believe that compliance with such an instruction would compromise safety of flight (and even then you don't get carte blanche to deviate: you must advise the controller that you're unable to comply, explain why, let him know what you're doing instead, and give him the chance to make a different instruction with which you're able to comply). If you're looking to see the sights, or just fly around for awhile before returning to the airport from which you started, IFR is probably not the way to go. The nature of the air traffic control system on VATSIM also leads to a few quirks relating to IFR flight. With rare exceptions, if you file IFR in the real world, you'll be under positive control in the ATC system from the moment you take off until the moment you land, unless you cancel IFR at some point along the way. On VATSIM, of course, air traffic control centers aren't open on a 24/7 basis, and you may find that when you set up to start a flight, there aren't any controllers online where you're flying. Until you are in contact with ATC, you'll be responsible for your own terrain and traffic separation; nonetheless, we encourage you not to squawk 1200 (or whatever the VFR code is in the region where you're flying) or to enter â€œVFRâ€ as the flight type when you file your flight plan. The reason is simple: VFR targets show up differently on the ATC radar, so if I see your aircraft entering my airspace squawking VFR, I won't contact you, and will instead assume that you're going to follow all the rules of VFR flight (as I'll explain below). If you really were planning to fly IFR, this can lead to serious confusion. Instead, if you're flying IFR and there's no ATC online, file your flightplan as usual, fly a standard IFR altitude/flight level (odd altitudes for a 001 to 180 bearing; even for 181 to 360), squawk the generic IFR code (2200) and if a controller logs on, he'll know to contact you. If you're flying in Class Alpha airspace, you must file IFR. The highest allowable VFR altitude is 17,500 for eastbound flight, 16,500 for westbound. Most airliners' optimal cruise levels range from 28,000 to 41,000 feet depending on weight, and particularly on a longer flight, flying below FL180 would be seriously inefficient with regard to fuel burn and speed. If you don't want to worry about accidentally violating restricted or controlled airspace, IFR is a safe choice. If you think you're likely to need an instrument approach, you'll want to be IFR. If the weather at your origin or destination airport does not meet the standard VFR minima (3 statute miles' visibility, 1000-foot ceiling), or if you expect to encounter low ceilings enroute that might prevent you from being able to maintain visual conditions, the safe play is to file IFR. ATC will provide radar separation from traffic to all IFR aircraft - this is particularly helpful on VATSIM where due to software limitations it can be difficult to see other aircraft. If you're unfamiliar with the area and may not be able to navigate visually to your destination, it's better to file an IFR flight plan. ATC generally does not provide radar vectors to VFR aircraft except in busy terminal areas (for traffic separation purposes only) or cases of VFR aircraft â€œin distressâ€ (ie. those unexpectedly caught in bad weather and unable to maintain VFR conditions). Perhaps even more so than with IFR, misconceptions abound on VATSIM as to the meaning of Visual Flight Rules and, particularly, requirements for ATC communication. I've seen a few too many pilots sailing blissfully through busy terminal airspace squawking 1200, believing that since they're VFR they don't have to be in contact with ATC. Unfortunately, it's not that simple - in real life or on VATSIM - and that kind of irresponsible pilotage is a good way to get in trouble with the FAA or the network supervisors, respectively. As mentioned above, Class A airspace extends from 18,000 to 60,000 MSL. VFR flight is not allowed in this airspace. Class B airspace exists to protect the area around the USA's busiest commercial airports. There are three Class Bravo airspaces in the Los Angeles ARTCC: Los Angeles; Las Vegas; and San Diego. Although each Class B is shaped somewhat differently depending on traffic flows, Class Bravo airspace typically looks something like an upside-down wedding cake with two or three layers. Within roughly a 5-mile radius of the primary airport, the Class Bravo will generally extend from the surface to 10,000 feet. The second â€œringâ€ extends further out (for the sake of discussion let's say 5 to 10 miles from the primary airport) with the â€œfloorâ€ of Bravo airspace at 3 to 4,000 feet and the â€œceilingâ€ again at 10,000. Finally, there's often a third â€œringâ€ that can extend as far as 20 miles or more that extends vertically from 6 or 7,000 to 10,000 feet. Frequently, other satellite airports will be located under (though not actually within the vertical boundaries of) the Class Bravo airspace - for example, Santa Monica [KSMO] or Hawthorne [KHHR] in the LAX Class B, or Montgomery Field [KMYF] in San Diego - so you may still need a â€œtransitionâ€ through the Class Bravo when departing or arriving at one of these airports, even though you're not visiting the primary airport. To know the exact vertical and lateral limits of Class Bravo airspace, it's handy to have a VFR sectional chart. The continental USA is divided into 38 sections, and each has its own â€œsectional.â€ You can purchase these for a few dollars each from any pilot supply shop, but they're also available for viewing online at http://www.myairplane.com/databases/approach/index... , or for download at www.avsim.com (register for the file library and try a search for VFR sectionals). Other charts that are particularly helpful when dealing with controlled airspace are Terminal Area Charts, often shortened to TACs. These too can be purchased from pilot supply shops, and viewed or downloaded online using the links above. Class Bravo is the only type of airspace in which VFR aircraft are required to have a specific clearance in order to operate. This means that until you hear the magic words, â€œ[your callsign], cleared into the Class Bravo airspace,â€ you must remain clear. Accordingly, it's usually a good idea to call up the controller responsible for the airspace (usually the approach controller at the primary airport - eg. LAX_V_APP, better known as Socal Approach, is responsible for the Los Angeles Class Bravo) well in advance. If the controller is busy you might well have to wait a few minutes before receiving clearance to enter. While you're waiting, you're responsible for staying outside the Class Bravo airspace. It's also remotely possible (though unlikely on VATSIM) for the airspace to be too busy to allow VFR aircraft to transition. Many Class Bravos have alternate â€œtransition routesâ€ or â€œVFR corridorsâ€ set up to allow VFR aircraft to transition, sometimes without needing to talk to air traffic control. Los Angeles, for instance, has a Special Flight Rules Area (SFRA) that allows VFR aircraft to transit right over LAX at 3,500 (southeastbound) or 4,500 (northwestbound) without having to contact ATC. 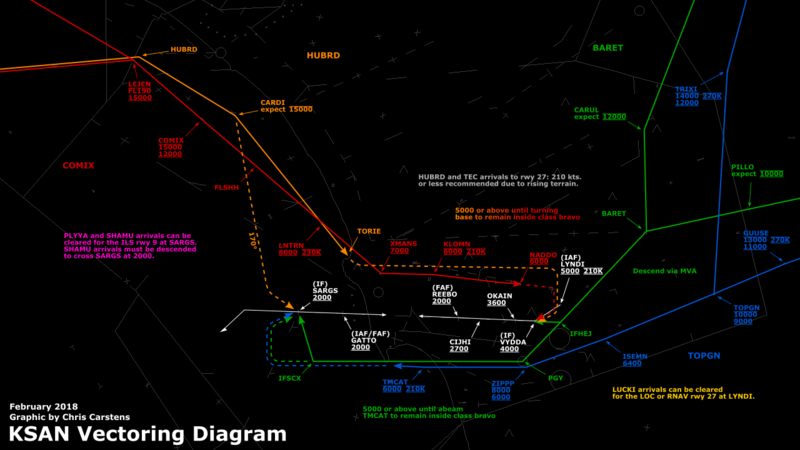 You can find more information on VFR corridors on the appropriate Terminal Area Chart (TAC). Class Bravo is also unique in that even as a VFR aircraft, you will receive radar separation from all other aircraft - even other VFR aircraft. This does not mean that you should stop scanning for other traffic - this is always a good idea even when IFR, since controllers do make mistakes from time to time - but because Class Bravo airspace is so busy, all aircraft need to be under positive radar control. Accordingly, a controller is legally permitted to issue a â€œhardâ€ heading or altitude (for example, fly heading 090, or maintain 3,500) to an aircraft operating VFR in Class Bravo airspace. However, the pilot is still responsible for maintaining VFR conditions. If you are assigned a heading or altitude that compromises your VFR (for instance, if ATC steers you into a cloud) you must advise the controller that you are unable to maintain VFR and request alternate instructions. Typically, you'll be assigned a discrete squawk code and taxied to the active runway. The tower controller, will clear you for takeoff and usually (though not always) give you an altitude restriction, something like â€œmaintain VFR at or below 4,500 until advised.â€ Once you're airborne, you'll be handed to approach control, who will establish radar contact and give you traffic advisories until you're leaving the Class Bravo. At that point, unless you've requested further flight following (more on flight following below), you'll be told â€œleaving the Class Bravo airspace, radar services terminated, frequency change approved, squawk 1200, maintain VFR, good day.â€ Reset your transponder to 1200 (the VFR squawk code), tune UNICOM (122.8), and you're good to go. Note that once your radar services are terminated, you're free to choose your own altitude. To maintain separation from IFR traffic and opposite-direction VFR, you're encouraged to cruise at â€œappropriate VFR altitudesâ€ - if you're heading west, these are even thousands plus 500 feet (4,500, 6,500, 8,500 etc. ); if you're eastbound, you'll want odd thousands plus 500 feet (3,500, 5,500, 7,500 and so on). If you're departing VFR from a non-primary airport under the Class Bravo: First, you need to find out whether the approach controller is providing tower services at the airport from which you're departing. If so, things will happen pretty much exactly as in the paragraph above. 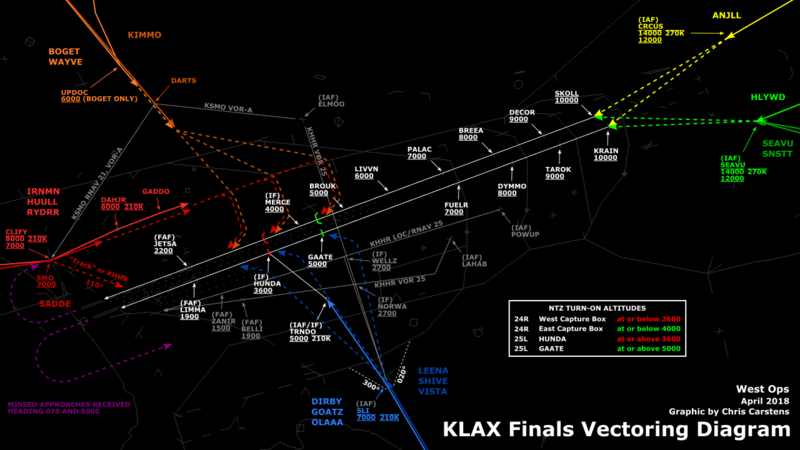 In almost all cases, however, ZLA simulates non-primary airports as uncontrolled fields, in which case the controller will likely say something like, â€œVFR departure at your discretion, contact me airborne for Class Bravo airspace transition.â€ This means that you squawk 1200 (the VFR code), choose a runway, taxi, take off, and once airborne, contact the approach controller for clearance into the Class Bravo airspace. Generally the controller will advise you to â€œreset transponder, squawk (discrete code) and IDENT.â€ Set your transponder to the assigned code, push your IDENT button (found on the Squawkbox Host panel), and the controller will reply with â€œradar contactâ€ and your position. He'll then clear you through the Class Bravo airspace, possibly with an altitude restriction as above. And once you're clear of the Class Bravo, you'll get a frequency change and squawk 1200. You should be familiar with the basic VFR pattern and able to join as the controller indicates, but if you have any questions, just ask and the controller will help you out. If you're landing at a non-primary airport under the Class Bravo: You'll follow the same procedure as directly above - contacting the approach controller and getting cleared into the Class Bravo. However, since ZLA doesn't generally provide tower services at satellite airports, once you have the field in sight you'll generally hear, â€œ(Airport) Tower is closed, radar services terminated, change to advisory frequency approved, squawk 1200, maintain VFR, good day.â€ Then it's up to you to decide which runway you're going to use and how to enter the pattern. You should switch to UNICOM (122.8) and announce your intentions, just like you would at any non-towered field, just in case there's other traffic operating in the area. Class C airspace is similar in principle and purpose to Class B, but is reserved for airports that are not quite as busy. 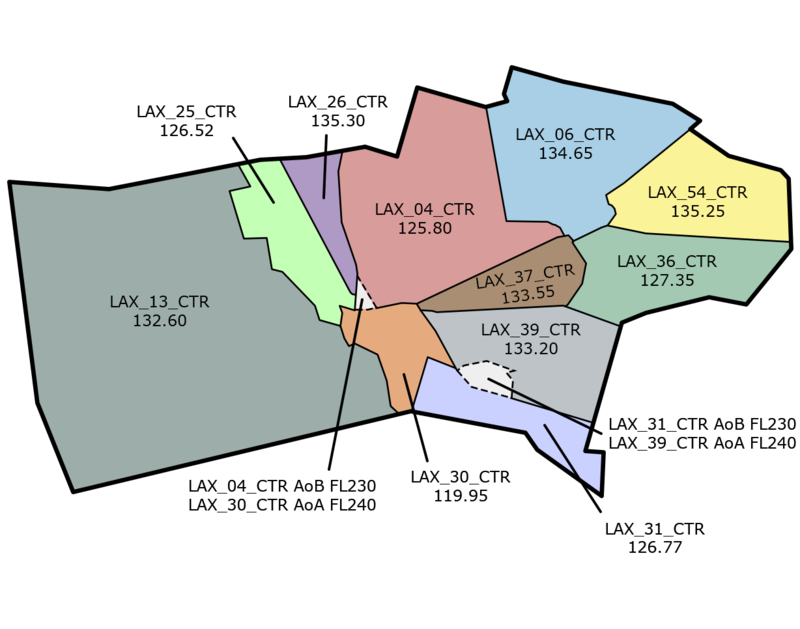 Class C airports in the Los Angeles ARTCC include Ontario International (KONT), Burbank/Bob Hope (KBUR), John Wayne/Orange County (KSNA), and Santa Barbara (KSBA). Additionally, Palm Springs (KPSP) has a Terminal Radar Service Area (TRSA) that is in many ways analogous to a Class C.
Class Charlie airspaces are typically much smaller than Class Bravo and usually have only two â€œlayers.â€ Generally the surface Class C covers a five-mile radius of the primary airport, up to around 5,000 feet. The outer ring typically covers an additional five miles or so and typically spans from 2,500 to 5,000 feet vertically. As with Class Bravo, it's possible that other airports may be located under this outer ring of the Class C - the Burbank Class Charlie contains two such airports, Van Nuys (KVNY) and Whiteman (KWHP). ATC services within Class Charlie are much more limited, as are the clearance requirements. To transition Class Charlie airspace (whether departing or arriving a Class C airport, or simply passing through), the only requirement is that you must establish two-way communications with the controller responsible for the airspace prior to entry. For instance, if you call up the Socal Approach (Burbank) sector and say â€œN527MS is type Cessna 172, 6 miles east of Bob Hope airport, request VFR transition westbound through the Class Charlie,â€ and the controller responds, â€œCessna 7MS, standby,â€ you're allowed to enter the airspace. If the controller establishes two-way communications by using your callsign (saying â€œlast aircraft transmitting, standbyâ€ doesn't count as two-way comms because the controller isn't sure to whom he's speaking), and says anything other than â€œremain clear of the Class Charlie,â€ that's good enough for entry. Since you don't need a specific â€œcleared into Class Charlieâ€ instruction, you'll never hear this phraseology in the real world, and only occasionally on VATSIM (and if you hear it on VATSIM it's usually just because many pilots don't understand these rules and won't enter any controlled airspace without a specific clearance to do so). Controllers are required to separate IFR traffic from VFR aircraft in Class Charlie, and to make this easier they can impose headings and altitudes, although these are somewhat less frequent than in Class Bravo airspace. They are also not required to separate VFR aircraft from each other. You're VFR, it's thus your responsibility to see and avoid other aircraft. For this reason, although a controller may radar identify you in a Class C, it's not technically necessary - even if the controller has several different VFR targets on his scope, he doesn't really need to know which is which because they're all maintaining their own separation. VFR departures and arrivals within Class Charlie operate similarly to those within Class Bravo, except the airspace isn't quite as big (so you won't be talking to the approach controller for very long) and the rules are less restrictive. In general, if you're departing, the tower controller will pass you off to the approach controller who will keep an eye on you for a couple of minutes (and warn you about any other traffic in the area) until you're headed out of the Class C, and then cut you loose. On the way in, or if you're just passing through, just call up the approach controller a few minutes before you enter (let's say once you get within 20 miles of the arrival airport) and he'll say hello and (possibly) assign you a squawk code. If you're landing, you'll get a frequency change to the tower once you have the field in sight. Class Delta is the classification for airspace in the immediate vicinity of any airport with an operating control tower (except for primary airports within Class Bravo or Charlie surface areas, as above). 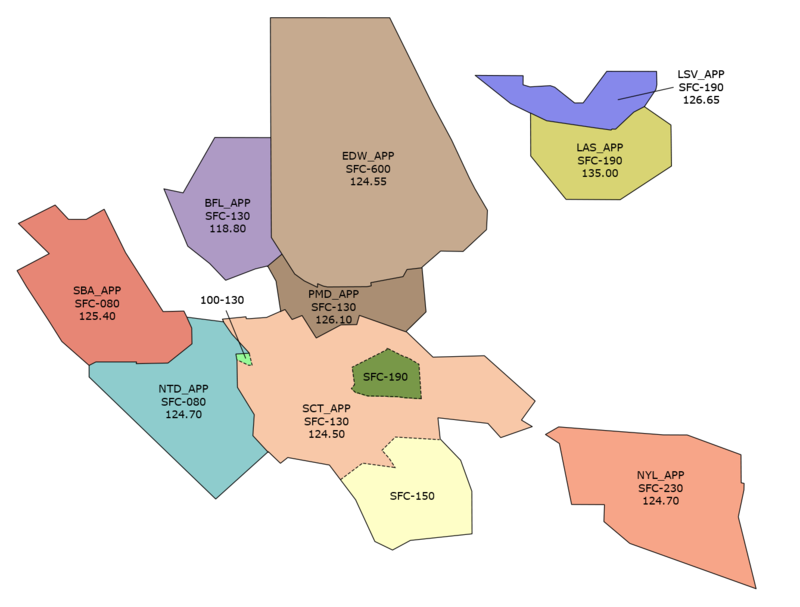 Within the Los Angeles ARTCC, some examples of Class D airports include Bakersfield (KBFL), Palomar (KCRQ), Santa Monica (KSMO), and surprisingly for many airline pilots, Long Beach (KLGB). In most cases, Class D encompasses a five-mile radius around the airport, from the surface to 2,500 feet AGL (above ground level). This airspace is the responsibility of the tower controller, and it essentially exists to contain one or more traffic patterns for the airport's runways. For that reason, and because Class D towers don't have radar, the only separation that's provided is runway separation, which the tower controller provides with his own eyes (possibly augmented by the ever-present binoculars), not any fancy electronics. If you're departing, the tower will make sure the runway's clear, and if you're landing, he'll get you established in a sequence (possibly telling you to follow another aircraft ahead), and make sure any other aircraft have cleared the runway by the time you get there. Other than that, you're on your own. As with Class Charlie, the only requirement prior to entry into Class Delta airspace is that you must have established two-way communications with the controller. It's fairly rare for VFR pilots to enter Class Delta airspace unless they're landing at or departing from the airport it serves, so this usually isn't a problem. (If you're landing, I hope you planned to call the tower more than five miles out, and if you're departing, you'll certainly want to talk to the tower controller before you take off.) In the rare case that you're flying VFR at or below 2,500 and you need to overfly a towered airport, you'll want to call the tower controller in advance. As with Class C, you probably won't get a specific clearance (eg. â€œcleared into the Class Deltaâ€) and in fact â€œ[your callsign], standbyâ€ is enough, but since Class D airspace is rather constricted (laterally and vertically) and traffic patterns can be busy, the controller may not be ok with letting you cruise through wherever you want. It's considered most polite, in fact, to overfly the field perpendicular to the active runway (for instance if runway 36 - heading 360 - is active, you would fly over on heading 090 or 270) at midfield, and at least 500 feet above pattern altitude (the pattern is usually 1,000 feet above the field elevation). This minimizes the chance of airborne conflicts and also makes it a lot easier for you to see aircraft in the pattern, and vice versa. You might think of Class E as â€œEverywhereâ€ or â€œElementalâ€ airspace. 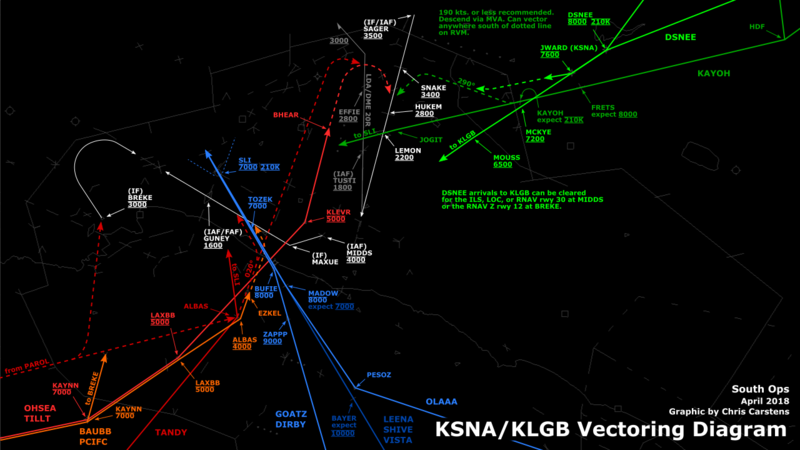 There's really no simple classification other than to say whatever airspace isn't Class A, B, C, D, or the fairly rare (at least in Socal) Class G airspace (I won't discuss Class G in this article, as the distinctions between E and G airspace aren't terribly relevant to VFR pilots), is Class Echo. Class E airspace, in Socal, extends nearly from the surface (to be technical, it's either 700 feet AGL or 1,200 feet AGL depending on the area - this information is provided on sectional charts) to 18,000 feet MSL (remember that all airspace above 18,000 MSL is Class A). Within Class Echo, VFR aircraft aren't required to be in contact with air traffic control and are responsible for their own navigation and separation from terrain and other traffic (minimum safe altitudes for terrain clearance are available on sectionals; and for traffic purposes, it's a good idea to use the VFR-appropriate cruising altitudes that I discussed earlier in this article). Airports without an operating control tower (including many Class C and D airports that aren't â€œcontinuous attendance,â€ whenever the tower isn't open) also become Class E surface areas. Pilots wishing to land or depart announce their intentions on the CTAF (common traffic advisory frequency); in the real world the frequency varies depending on the airport, though on VATSIM it is always the UNICOM frequency, 122.8. VFR advisories: There are a lot of misconceptions as to what constitutes this service, commonly known as â€œflight following.â€ Getting VFR advisories from ATC simply means that the controller will radar identify you (assign you a squawk code and track you on radar), and provide advisories for any nearby traffic, workload permitting. It doesn't mean you're IFR, doesn't mean you're getting vectors to your destination (although if you're lost ATC can suggest a heading that will get you where you want to go), and doesn't mean that the controller is providing separation from traffic or terrain. You are receiving advisories only, and services to VFR aircraft constitute ATC's lowest operational priority, so you may not get an advisory for every aircraft nearby if the controller is particularly busy. In fact, if the controller is especially busy he may say â€œflight following unavailable, squawk 1200 maintain VFR.â€ It's a supplementary service, performed on a workload permitting basis. Nonetheless, in a busy airspace, it's extremely helpful to have another set of eyes watching for traffic - particularly when those eyes are looking at a radar scope that provides a lot more situational awareness than you have in the cockpit. So if it's available, flight following is always a good idea. In-flight IFR clearance: Although Squawkbox asks you to choose IFR or VFR when filing a flightplan, you're not locked into this choice for the duration of your flight. If you file IFR and then decide you the weather's good enough to navigate visually, you can cancel IFR and proceed VFR (just remember that you're still subject to the airspace restrictions as above - so if you're flying to LAX and thinking of canceling IFR to avoid a vector you don't like, you can do so but you'll still have to talk to ATC and be sequenced, since LAX is in Class Bravo airspace). Similarly, if you originally planned a VFR flight but the weather turns out worse than expected, or you're having trouble navigating, it's possible to file IFR while airborne. Just call up the controller responsible for the airspace in which you're flying (if you're not sure, call Los Angeles Center, since he has more airspace than anyone else), state your aircraft type, current position (approximate), and that you'd like to pick up an IFR clearance to (insert your destination here), and you'll receive the clearance within a few minutes. If you don't have a defined, point-to-point route - for instance, a sightseeing flight, or a city tour of some kind, or what student pilots call a â€œcross-countryâ€ flight that involves visiting several different airports in a few hours - VFR is the way to go. If the weather's good and you know the area well enough to navigate visually (possibly with the help of GPS, which can be a great tool for VFR pilots) to your destination while maintaining your own separation from traffic, IFR may be unnecessary. Flying VFR can be tricky, but it can also be tremendously rewarding. I encourage all pilots to grab a sectional chart (you can always â€œcheatâ€ a little with the GPS) and give it a try. And where better to try than Southern California? With VFR skies practically all year round and the most knowledgeable controllers on VATSIM, flying VFR in our skies is really a joy.